As Marketing Copywriter for leading language service provider, Language Connect, I became a regular contributor in B2C – Business 2 Community – covering digital progression within the realm of language, translation, localisation and emerging markets. Gone are the days when most marketing was conducted offline. Throughout 2012, many businesses incorporated an element of social media within their marketing strategy, but is enough attention being paid to online media as a vital marketing channel worthy of its own integrated plan? There are few businesses able to boast significant digital success without one. A carefully constructed strategic plan based on thorough research can generate an influx of targeted traffic to your website, and improve online presence. Do I have a great product or service and what is its unique selling point? Without a strong answer to this question, your online activity will lack substance and worth. Remember, the market you are targeting is global so you need to adapt your online activity to meet the needs of different geographical markets. Unsurprisingly, recent studies unveiled that 72.4% of consumers would be more likely to buy a product if information was offered in their own language, which is understandable. If you were expected to translate from Spanish into English to order a product online, you would probably go elsewhere. You must research trends and demands within your product’s market to understand what people want. If you can’t satisfy their demands your chance of online success is minimal. Online engagement is dependent on targeting the right people at the right time; offering a product or service to someone in need, at a time that is convenient for them. Is your website Search Engine Optimized? If not, this should be at the top of your priority list. Websites act as the online face of your business. By ranking highly in search engines, you are significantly improving the likeliness of increased sales. Consider localisation as a key business priority. Simply translating your site into another language using an online translation service isn’t enough. There are approximately 518,512,109 internet users in Europe alone. Does your website cater to the cultural, literal and legal needs of these multiple countries? Certain colours, terms or images may be deemed offensive in a particular culture. Certain words change meaning from country to country and historic cultural sensitivities must be considered. We are operating in an internationally integrated market where national and cultural resources are interchangeable. In order to be successful, you need to adapt. Did you know 56.2% of consumers say that the ability to obtain information in their own language is more important than price? By investing in website localisation and SEO optimization now, you are highly likely to enjoy organic business growth and subsequent incremental profits in future. Get involved in industry discussions, contribute in forums, post news updates and ‘like’ pages that are relevant to your business. Write topical articles in a company blog and integrate with Facebook, Twitter and Linked In pages, as well as your website. Utilise all content created by your business and recycle content if needs be! A sentence from a press release could create an interesting Twitter discussion. But don’t get carried away. Remember you want to be perceived as credible. Only post relevant and interesting content. Nobody in your industry needs to know what you had for breakfast. Look into document translation services to gauge the potential value multi-lingual content could have for your business. Your product or service could satisfy overseas demands not currently met. Through effective content marketing you can reach a broader audience and establish yourself as an industry expert. 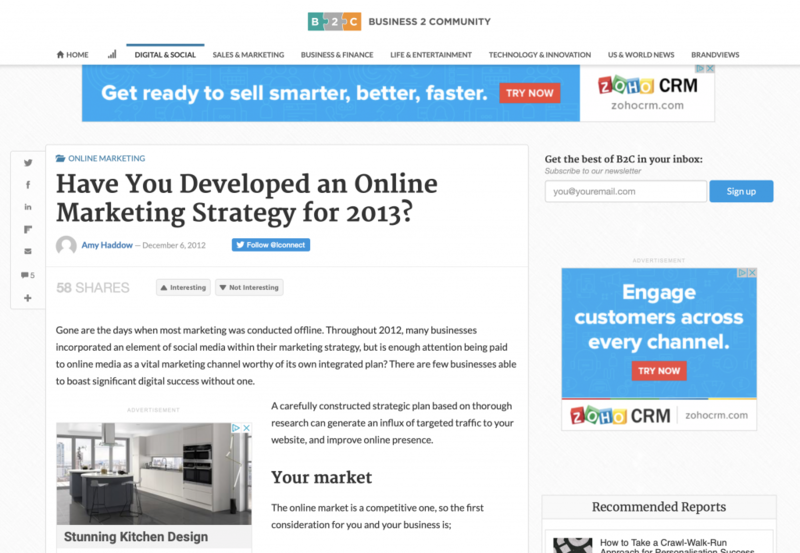 Your online strategy should of course be set with the intention of achieving your marketing objectives for 2013, which should in turn be aligned to your corporate objectives. Remember, your strategy will create longer term direction whereas your tactics will satisfy shorter term objectives such as a boost in website traffic or increased Facebook ‘likes’. Ask yourself; what do we want to achieve in terms of online presence? Who are we looking to target and how can we increase our share of voice? Are we looking to increase market share or increase sales? Ensure your brand doesn’t become diluted by ensuring a consistent cross-cultural message. Engage experts to localise your website and help optimise your content to improve SEO. The digital world is constantly evolving and your online strategy will need to evolve with these changes throughout the year to ensure your business is seen as innovative and current.